Bluetongue virus (BTV), a member of Orbivirus genus (family Reoviridae), is a non-contagious infection of domestic and wild ruminants. 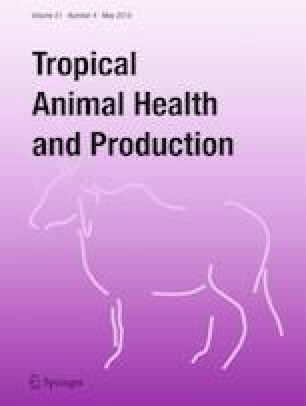 The current study was designed to detect various serotypes of BTV in small ruminants of Khyber Pakhtunkhwa (KPK) province of Pakistan, along with their effects on hemato-biochemical parameters. A total of 408 serum samples in four districts (Mansehra, Abbottabad, Swabi, and Kohat) of KPK from small ruminants were screened based on competitive ELISA (cELISA). A total of 204 (50%) samples were found positive for BTV group–specific antibodies. The seropositive samples were processed for the detection of BTV serotypes through real-time polymerase chain reaction (qPCR). Out of 204 cELISA-positive samples, 60 (29.41%) were found positive through qPCR. Three serotypes [6, 8, 9] were detected from Mansehra District and two from Kohat [2, 8] and Abbottabad [6, 8], while only one from Swabi . The serotype “8” was found consistently in all the four study districts. A significant (p < 0.05) increase in the level of blood urea nitrogen (BUN) and alkaline phosphatase (ALP) was recorded in goats, whereas aspartate aminotransferase (AST) in sheep infected with BTV, compared to healthy animals. The hematological parameters showed significantly (p < 0.05) raised total leucocyte count (TLC) in both sheep and goats, whereas only hematocrit (HCT) value was increased significantly (p < 0.05) in infected sheep. This is the first report on serotyping of BTV among small ruminants in Pakistan. This study was funded by the Higher Education Commission of Pakistan under grant no. 20-3307/NRPU/R&D/HEC/13/674.